Ribéry's interested in leaving, but not for England, as the weather is too similar to Germany. Or so was it reported. Money spending Madrid would be keen on him, and he'd be keen on them. He says he doesn't know whether he'll stay or go. He had the same approach in 2006/07 at Marseille. And he left. Ronaldo waving bye bye will be pretty much stimulating for Fergusson. He'll like it. In that case Real may be where he's going. they've already hinted that they're going for one more big player this summer and riberry may just be the one. real wanna be careful not to 'do a leeds' and end up with nothing having spent big and with a massive shortfall. Agreed, but they've been there before and been bailed out. A few years back their local council bought their training ground for a few hundred million. i know. i am a leeds fan so i feel the pain every day haha. we are gonna buy it back though, we got a really nice lawnmower the other day too. Kaka was €65 million, Ronaldo €94 million. Perez said he has €300 million to spend, so he's still got €141 million left. David Villa, Franck Ribery, Xabi Alonso... supposedly Real have already offered around €40 million for Villa. I could easily see Ribery going from Bayern Munich to Real Madrid and then 1-2 Dutch players going the opposite way. Louis van Gaal is crazy enough to create a Dutch colony in Munich like he did before in Barcelona. I dreamt about ronaldo last night, or more accurately he was in my dream. How depressing. i'm depressed at the reality of so many weekends ahead without any football. This is made to feel worse because there's no F1 this weekend. I'm in a total sport-less void right now, and it's horrible. I read that as Morrissey singing the line from Reel around the Fountain, the next line would be "and he fell on his arse twice"
It's like methadone maintenance treatment for people like you. Do it, or you'll have to live the rest of your life knowing you've missed the live coverage of New Zealand v Iraq. Torres hattrick vs New Zealand within 17 minutes of kick-off! Oh boy, the Kiwi defending is just appalling, especially at the 4-0 and 5-0.
they sell man u tops in urban outfitters i discovered earlier today. Anyone been paying any attention to the Confederations Cup at all? I haven't watched any full games yet, but I'll probably watch Brazil v Italy tonight. 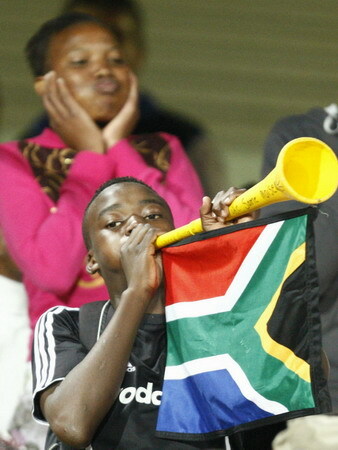 It's going to be a loud World Cup next year with the South African fans blowing the vuvuzelas for 90 minutes every game. But the most exciting football news this week was that after South Korea, North Korea have qualified for the 2010 World Cup as well, for he first time in 44 years. I really hope they'll get drawn in the same group as the United States (should they qualify) and I wouldn't mind seeing The Netherlands v North Korea too.